This book provides a comprehensive examination of the effects of a natural disaster on businesses and organisations, and on a range of stakeholders, including employees and consumers. Research on how communities and businesses respond to disasters can inform policy and mitigate the cost and impacts of future disasters. This book discusses how places recover following a disaster and the vital roles that business and other organisations play. 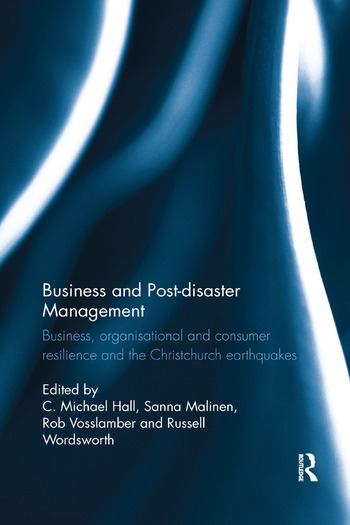 This volume gives a detailed understanding of business, organisational and consumer responses to the Christchurch earthquake sequence of 2010-2011, which caused 185 deaths, the loss of over 70 per cent of buildings in the city’s CBD, major infrastructure damage, and severely affected the city’s image. Despite the devastation, the businesses, organisations and people of Christchurch are now undergoing significant recovery. The book sheds significant new light not only on business and organisation response to disaster but on how business and urban systems may be made more resilient. C. Michael Hall is a Professor with the Department of Management, Marketing & Entrepreneurship, University of Canterbury, New Zealand, and Docent in Geography, University of Oulu, Finland. He also holds positions at the School of Business and Economics, Linneaus University, Sweden, and School of Business, University of Johannesberg, South Africa. He has published widely in the areas of tourism, environment change, regional development and sustainability. Sanna Malinen is a Senior Lecturer in Human Resource Management and Organisational Behaviour at the University of Canterbury. Her research interests are in the fields of organisational behaviour, organisational psychology and human resource management. She is a lead researcher in the Employee Resilience Research group. Rob Vosslamber is a Senior Lecturer in Accounting at the University of Canterbury. His research interests include accounting theory, accounting history and taxation. Russell Wordsworth is Lecturer in Human Resource Management at the University of Canterbury. His research interests are in the fields of human resource development, employee attraction and retention and ethics in human resource management.